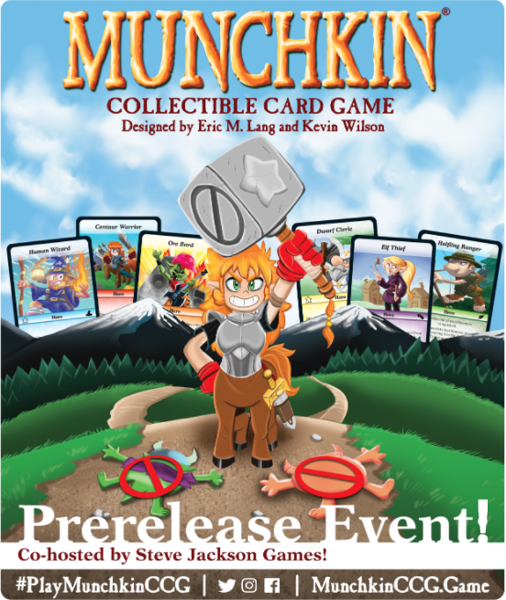 Daily Illuminator: Come to a Munchkin Collectible Card Game Prerelease Event! January 8, 2018: Come to a Munchkin Collectible Card Game Prerelease Event! The Munchkin Collectible Card Game hits stores in late February – but we know some of you don't want to wait that long! So we've worked with select stores around North America to plan Munchkin Collectible Card Game Prerelease Events for late January! In the Munchkin Collectible Card Game, players go head-to-head as fantasy-style heroes using cards chock full of Munchkin-style jokes, in a game designed by award-winning creators Eric M. Lang and Kevin Wilson. If that sounds good to you, check the list of stores below to see if we'll be holding a prerelease at one near you! Each event will be limited to 12 participants. Steve Jackson Games will send a staff person to each one, to teach participants how to play the game. Every player will go home with one of the six starter decks, plus promos. Don't see your favorite game store here? You won't have to wait too long to play, but you will have to wait a little while. Until the first weekend in March, to be exact. That's when a lot more stores will host Munchkin Collectible Card Game Release Events! Either way, follow the Munchkin Collectible Card Game page on Facebook for the latest news. Now, on to the prerelease list! Friday, January 26 - 6 p.m.
Saturday, January 27 - 1 p.m.
Sunday, January 28 - 1 p.m.
Saturday, January 27 - 12 p.m.
Friday, January 26 - 6:30 p.m.
Saturday, January 27 - 6 p.m.
Sunday, January 28 - 3 p.m.
Sunday, January 28 - 4 p.m.
Saturday, January 27 - 5 p.m.
Thursday, January 25 - 6:30 p.m.
Sunday, January 28 - 12 p.m. and 3 p.m.
Thursday, January 25 - 5:30 p.m.
Saturday, January 27 - 2 p.m.